1. The Amazanauts is a never-ending story! The Amazanauts is not a strictly linear narrative, but more of a Danger Room on steroids. There is a single campaign mission to introduce the cast of characters. Then in THE FRACTURE (ie the Danger Room) there are four scenarios that you can play, and five maps to choose from which support these scenarios. Each map is a self-contained story with cutscenes and narrative content. Perhaps "interactive sketchbook" is a good description. You will get a beginning and middle, but you won't find an ending in here. I'll talk about why I made this decision after it has been released. 2. Some familiar faces will return! If Superman can have a cosmic adventure with a number of parallel versions of himself, then so can Miss Amazing. This was my original pitch to myself that convinced me I could put together a quick-ish mod for Freedom Force to see how economically I could describe a new group of characters. 4. You get to fight the creators! Well, sort of. You'll see what I mean. 5. The scale is turned up to 11!! As befits seven of the most powerful characters in the universe, the scale is completely dialled up here. You'll travel from the very start of the universe to the very end, and a few wierd places besides. 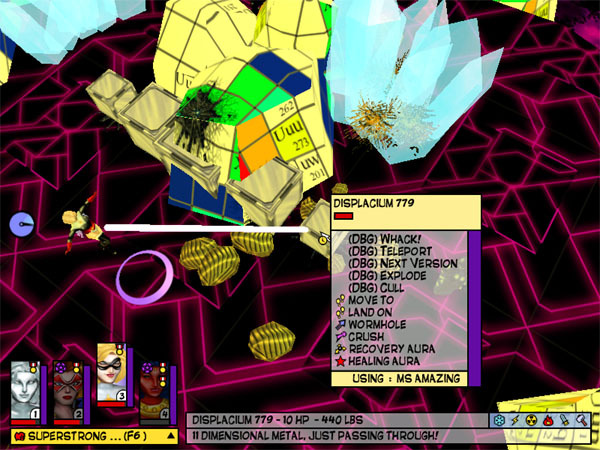 There is no character progression due to the Danger Room format, so all team members are fully powered up all the time. This won't be as challenging as the eraly Strangers was, and is aimed at being more of a spectacle than a grind. There are a few cool new scripting tricks and powers in here for your enjoyment, of course. 6. The Amazanauts is a standalone product! 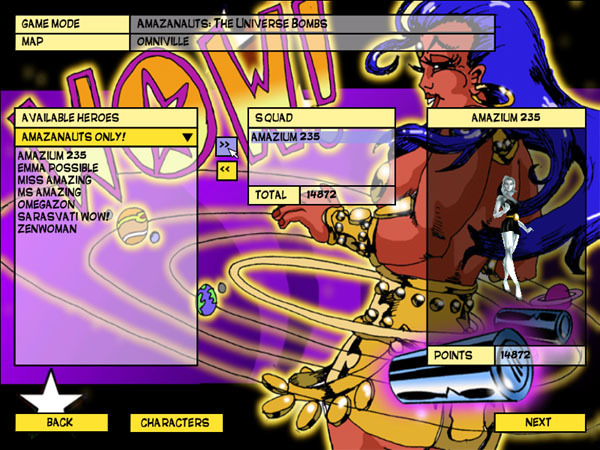 Amazanuats will isntall onto Freedom Force from Steam or the original game with the 1.3 Patch without needing FFX. It uses an independent copy of all script files to allow new players to run it with the minumum of fuss. 7. The Amazanauts is full of music and art! No longer bound by dial-up, I've included as much music and custom art as I feel like this time round. All in-game art will be displayed in the Art Gallery when the Amazanauts is released.